There's no shortage of culture and history on this tour through Persia, Iran's cultural heartland. Travel along ancient trade routes through the footsteps of one of the world's oldest civilizations. Take in the expansive desert landscape, sleeping under the tapestry of a starry night sky, and marvel at the glittering opulence of city bazaars, oasis gardens, and some of the Middle East's most treasured mosques. Cycling through this storied region gets you up close and personal with history and some of the friendliest, most inviting locals in the world. What better place to begin than in Shiraz, the birthplace of Persian poetry? Your introduction to the history and culture begins here as you explore the city's gardens, tombs, and fortresses. Embark and ride to the impressive and fabled ruins of Persepolis. Venture further into the desert and into mountain foothills, passing ancient settlements and former Silk Road stops. Wonder the city of Yazd, home to the last remnants of the ancient Zoroastrians and their eerie religious monuments. In to splendid Isfahan, admire stunning attractions and to encounter the many proud and learned scholars that call the city home. Observe ancient ingenuity, from the mud-brick city of Abyaneh, to the the beautifully crafted pottery and tiles still produced today in modern Kashan. After so much history, ride into modernity, to the capital city of Tehran. These spectacular highlights, together with engaging locals, famous for their warm-hearted hospitality, are just some of the myriad of reasons to cycle through Iran. Meet at Shiraz airport and transport to hotel. Early evening tour briefing and welcome dinner. Explore the Garden city of Shiraz including the Zand complex that includes a fortress, Vakil Mosque, the Pink Mosque and the bustling bazaar. In the afternoon we will transfer to our hotel in Persepolis. In the morning visit Persepolis and cycle 70 km to Banesh then transfer to the hotel. Cycle to Margoon Waterfall, Iran's largest, and have lunch near there. Continue cycling through the mountains. In the late afternoon we transfer 2.5 hours to Eqlid, one of the highest Iranian cities at 2250 metres. Transfer to the desert and take a look around the ancient ice houses of Abarkouh. Short drive to the start of ride at Junction town of Dehshir cycle to Tang e Chenar then transfer to and overnight at 16th Century Zein al Din Caravansary on the Silk Road. A short drive to explore the traditional earthen architecture of UNESCO World Heritage city of Yazd. A day full of religion and history, from Zoroastrian pilgrimage sites, to Iran's oldest mosque, to citadels. Easy cycling, primarily downhill. Short cycle in the morning near Isfahan to Nik Abad. Transfer to Isfahan for lunch and late afternoon city tour. Rest day and explore Isafahan more. A morning ride through the desert with a nice descent to make things easier. Transfer up hill to one of the most beautiful villages in Iran, Abiyaneh. Spend the afternoon wandering around the village. Start with a downhill cycle to eco resort with organic farm. Visit breeding site to see camels and their calves. Riding from our lodge we take the old road to the pottery town of Kashan. After lunch, take a look in some historical mansions, the Fin garden and the bazaar. Our last cycling day through the desert to the underground city of Noush Abad. In the afternoon we transfer to Qom to visit a holy shrine before our overnight in the capital of Tehran. Be lead through the history and modernity of Tehran. After lunch, we walk through Grand Bazaar. Final celebratory dinner and review all the highlights of the trip. We will provide one group transfer to the airport for your departure flight. Day 3 - Persepolis - Banesh - Pooladkaf Ride 64km. +709m / -721m. Cycling was a wonderful way of meeting and interacting with the people of Iran. We wouldn't have had some of the fun experiences if we hadn't been riding. The ONLY way to see Iran. Stark wonderful countryside. The tour uses roads that are sealed and have a good surface. There are a couple of harder days on the tour, but the support vehicle allows you to do as much cycling as you wish. Choose which bits you want to ride; get a lift to the top of the hill and cycle down the valley if it suits you. Your leader will suggest how you can get the most out of the trip with total enjoyment. We all ride at different speeds, and this varies depending upon how we feel on the day. The guides tend to ride through the group, but stop at points to regroup. It is not essential that you try and keep up with everyone. Just ride at your own speed and enjoy it. If you are having a bad day, you will be supported. Remember, the vehicle is there for you, always driving at the back of the group. We have two rest days to be able to fully explore two of Iran's gems - the cities of Yazd and Isfahan. Suitability: You can expect a few challenging rides. The climbs are on paved roads, so a smooth, steady ascent is possible. There are two nights of camping in the desert, adding a bit of hardship to the tour. Being physically fit will, of course, be a huge asset, but as the tour is fully supported, the van is always close at hand if needed. Biking Conditions: This tour is primarily on paved roads and goes though mountains and hills as well as valley flatlands. There are a few challenging climbs, as well as some fast, sweeping descents. There will be a short section off-road. Any portion can be skipped by using our support vehicle. Our guide will meet you at the airport in Shiraz, Iran and transport you to the hotel. Please contact us for the best arrival time to join the pick up. We will meet up in the early evening for a tour briefing and welcome dinner. Today we explore Shiraz city by seeing some of the highlights including Eram Garden, Jahan Nama garden and tombs of the poets, Sa'di and Hafez, who lived in the 13th and 14th centuries. In the afternoon, we visit the Zand complex that includes a fortress, Vakil Mosque, the Pink Mosque and the bustling bazaar. 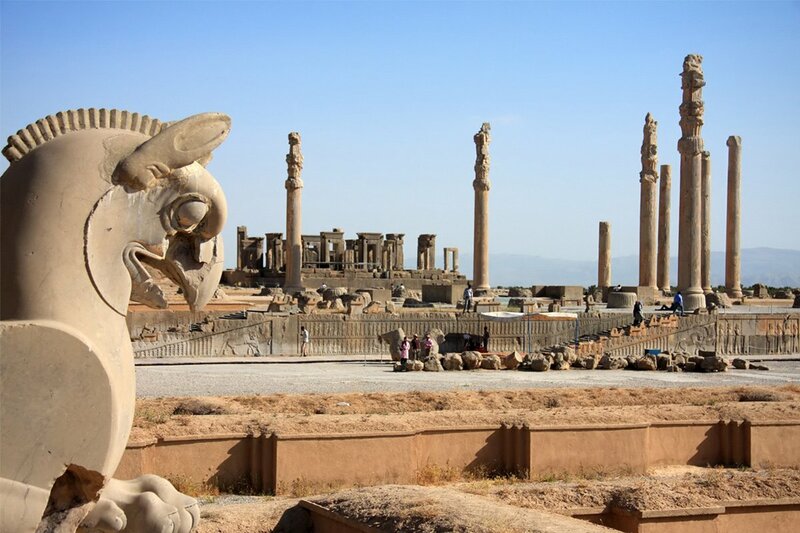 At the end of our city tour, we will transfer to our hotel right outside the gates of Persepolis. We start the day with a visit to Persepolis early in the morning, once the richest city on earth. Founded by Darius I in 518 BCE, the capital of the Achaemenid Empire was built on an immense half-artificial, half-natural terrace, where the king of kings created an impressive palace complex adorned in gold and silver, ivory, and precious stones. In 330 BCE, Alexander captured Persepolisand he ordered the palace burned to the ground. The spectacular ruins still reveal the glory of the Achaemenid Empire (it takes around 2 hours) then we will start our cycling for 70 km toward Banesh then we will transfer to the hotel. An easy start to cycling today as we ride down to Margoon Waterfall and descend more than 1000 metres. There is an 800 m walk to see one of Iran's largest and most beautiful waterfalls. We'll lunch in a restaurant near the waterfall, then have the option to cycle 13 km uphill or jump in the support vehicle. After 41 km we transfer 2.3 hours to Eqlid, one of the highest Iranian cities at 2250 metres. It is also considered the border between the high mountains and the desert. We transfer back down to the desert, passing fields of wheat, barley, potato as well as orchards of walnut, apple, and pear trees. We take a break to wander around Abarkouh, known for its ancient ice houses and being home to the second oldest tree in the world, a 4,000-year-old cypress. Then a short drive takes us to the start of our riding at the junction town of Dehshir. From here,we cycle on a minor road to Tang e Chenar. We will pass a few villages but for most of the ride,the stark beauty of sand and sky will be our companion. From Tang e Chenar we'll transfer the highway to our overnight at Zein al Din Caravansary. Situated on the ancient Silk Road, it is one of 999 such inns that were built during the reign of Shah Abbas I to provide facilities to travelers. Dating back to the 16th Century Zein al din is one of two caravanserais built with circular towers. It will be a unique experience to stay in such a historical place on the Silk Road. A day off the bikes to explore the city of wind catchers. A short drive takes us to Yazd, the oldest adobe city of ancient Persia that dates back 7000 years ago. It has been listed as a UNESCO World Heritage site as it has retained its traditional districts, the qanat system, traditional houses, bazars, hammams, mosques, synagogues, Zoroastrian temples and the historic garden of Dolat-abad. Home to Iran's second-largest population of Zoroastrians many of the sites we will see on our city tour will be from this religion, including the Towers of Silence where the dead were left to be picked clean by the vultures. No longer used, the cemetery is now a quiet, serene place. We will also wander the maze of lanes and alleys in the old district. We have a short transfer to visit the Zoroastrian pilgrimage site of Chak Chak (Pir E Sabz) where we can see the ever-dripping spring located at the mountain. Then it's time to get on the bikes to cycle downhill 38 km to the town of Ardakan, a Zoroastrian centre. From here we'll transfer 30 minutes to Aqda for lunch. Have a walk around this old village and see the Khaje Nemat Tower and pomegranates orchards. Our next stop is the oldest mosque in Iran, dating back to the 9th Century, the Jame Mosque in Naein. When we reach the town of Varzaneh we get back on the bikes and cross the last old bridge over the Zayanderud River. It has 10 arches, 7 of which were built about 9 centuries ago during the Seljuq dynasty. Varzaneh is also known as a weaving centre and we may see women plying their trade wearing white chadors, unlike the rest of Iran where they prefer black ones. About 12 km west of town we will ride by the ancient Ghoortan citadel which has survived natural disasters and many wars for thousands of years. Having very thick walls made of adobe mud brick made it a protected complex for people living in the region. The thickness of walls varies from 3 to 4 m and they are about 9 m high. The citadel has an area of 40,000 square meters. Nowadays, only four families are living inside. The citadel is protected by fourteen round towers contains four mosques, a pigeon house, a water reservoir, a mill and many houses though nowadays only four families reside there. We continue cycling through the dry desert landscape to Qehi. A short transfer takes us to our lovely guesthouse in the heart of the desert with a warm and welcoming host. We have a short morning cycle as we aren't far from Isfahan, a former capital of Persia and now Iran's third largest city. We end our ride at Nik Abad, a small village with an ancient citadel. We transfer to Isfahan for lunch and then go on a city tour to see why so many people have called this the most beautiful city in the world. With a profusion of tree-lined boulevards, picturesque bridges, Persian gardens, historic bazaar, UNESCO-listed Naqsh-e Jahan Square and important Islamic buildings we'll have lots to see in Isfahan on our afternoon city tour. Free day to continue exploring Isafahan. Visit the Cheehel Sotoon Palace, Fri mosque, Armenian Church or cross some of the many historical bridges. We will transfer just over an hour to the start of our ride today. Beginning at 2,000 m we drop down 500 m to end our cycle at 1500 m with no climbs inbetween. Finishing at Abyazan village, we transfer uphill to 2,500 metres and one of the most beautiful villages in Iran, Abiyaneh. The ancient village, dating to 1500 years before Islam came to Persia, seemingly melts into the hills as the mud-brick houses blend in with the surrounding rock. Spend the late afternoon wandering the narrow and sloped lanes of this compact village. We have a short ride today so that there is time to wander the alleys of Abyaneh and meet the colourful villagers. Once on the bikes, an amazing downhill lets us descend 1,300 m! We end in the desert at an eco-resort and organic farm. You can also visit the camels they breed on site and see the calves. Riding driectly from our overnight we cycle on an old road towards Kashan. Between the 12th and the 14th centuries Kashan was an important centre for the production of high quality pottery and tiles. In modern Persian, the word for a tile (kashi) comes from the name of the town. After lunch we'll take a look around some of the historical mansions, the Fin garden and of course the bazaar. For our last day of cycling we will ride directly from the hotel on another old road. On the way we will stop for a visit at the underground city of Noush Abad that might be more than 100 years old. Then continue riding in the road and after 30 km we jump in vehicle and continue on to Qom. In Qom visit one of the holiest and respected shrines belonging to Masoumeh, the sibling of the 8th Shia Imam. In the afternoon we transfer on to Tehran. Today we explore the bustling metropolis of Tehran, the capital of Iran and home to 14 million people. Your guide will lead through Persia's history as you visit Golestan Palace, a sprawling complex of 17 palaces, museums, and halls, the Iran National Museum which houses significant artifacts from ancient Persia and post-Islamic Persia as well as the Salt Man, a prince who was naturally mummified in a salt mine for 2000 years. After lunch we will walk through the Grand Bazaar where everything from copper, paper, gold, spices, and carpets. We have a final celebratory dinner and review all of the highlights of our trip. All nationalities require a passport for entry into Iran. Please ensure your passport is valid for at least 6 months from date of entry. Entry visas are required by all nationalities travelling to Iran and for residents of the UK, USA and Canada a preauthorisation code is required from the Iranian authorities. Australians are eligible for visa on arrival. SpiceRoads will obtain the authorisation code and invitation letters for you. The authorisation can take up to 30 working days to process (but is usually 14 days), however we will request the authorisation code 8-10 weeks prior to departure and will forward so you can apply for your visa. Note that the visa application must be made at the embassy stated in your application. For a list of consulates/embassies abroad go to this page. The cost varies depending on nationality but can be between US$60-US$120 and is subject to change. Please note admission is refused to holders of passports containing a visa/stamp for Israel and you may need to acquire a new passport. US passport holders and those who have travelled to USA (with evidence in passport) will usually be required to provide fingerprints on arrival in Iran. We will provide more comprehensive information on completing the application form with your booking confirmation. We recommend that you visit a travel medical doctor and ask about the following vaccinations for diphtheria, tetanus, measles, mumps, rubella and polio, as well as hepatitis B. While making preparations to travel, take the opportunity to ensure that all of your routine vaccination cover is complete. However, in Iran outbreaks are rare. Tap water is safe to drink in most of Iran, though many travellers stick to bottled water, which is widely available. Iran is a large country (three times the size of France) with varying terrain from mountain to desert. Most areas experience long, hot summers and short, cold winters with a marked contrast between the north, northwest, east and central desert regions. The best times to visit are March-May and September to October. Temperatures can spike from June to August (30-40 C) and be extremely cold Nov-Feb. Meals are included as per the itinerary where B = breakfast, L = lunch, D = dinner. Iranian cuisine includes a wide variety of foods ranging from kebabs (roasted meat), khoresh (stew_ ash (a thick soup), kuku(vegetable souffle) and a diverse variety of salads, pastries, and drinks specific to different parts of Iran. Saffron is a very common ingredient. White rice and flatbreads are the staple forms of carbohydrate and fresh fish from the Caspian Sea is available in the major cities. Food, and the quality and variety of it, is particularly important to Iranians and you will have the opportunity to try many of the regional specialty dishes. Special dietary requirements can also be catered for as well. Please let us know at the time of booking. Keeping you completely hydrated is a job we take very seriously. Cold water, some energy-restoring local fruit and soft drinks are included in the tour price while riding. Soft drinks and other beverages during meals are not included. There is no alcohol served in Iran. The local currency is the rial or tuman (10,000 rials). Please bring your travel money in either US dollars or Euros in cash into Iran. Credit cards are not widely accepted (and attract hefty commission rates where they are) and whilst there are ATMs they do not accept cards from foreign bank accounts. Note that it is not possible to buy alcoholic drinks in Iran.